In addition to its formal consultation of the municipalities and formal stakeholders, as stipulated in the regional Ordinance, the Brussels-Capital Region also wanted to mobilise (private and public) transport users in Brussels more generally, in order to make this plan a concrete tool that will serve quality of life and regional dynamism. From home to work, and taking in leisure, shopping, tourism and local mobility infrastructure, mobility is everywhere! It’s relevant to us all, and it’s a vital issue for the Brussels-Capital Region. To develop the new Regional Mobility Plan, the Brussels-Capital Region invited all Brussels inhabitants to take part in Good Move: a dynamic and participatory process for finding innovative solutions together. Parallel to the official advisory boards and collecting information in civil society and expert organisations, the Brussels Region also wanted to give the chance to all individual citizens to express themselves and therefore, with the support of CitizenLab, set-up a dedicated idea platform. The goal was to target the people that had no other means to express themselves than through online tools. CitizenLab partnered up with the experts of the Brussels based mobility and participation agency 21 Solutions during the whole set-up of the platform. 21 Solutions took the lead in the content creation and the communication of the platform, CitizenLab made sure the platform responded to the needs. 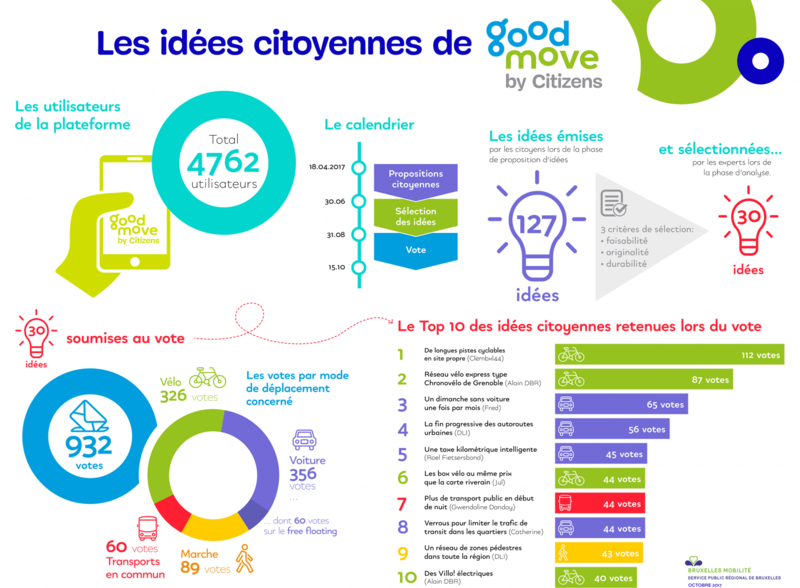 In spring 2017, the call for ideas from the general public launched by Good Move on the platform 'Good Move by Citizens' produced more than a 100 concrete, original and inspiring proposals for mobility in the Brussels-Capital Region. Citizens had to take into the account the tight schedule: the first phase lasted two months. 30 feasible, original and sustainable ideas were eventually selected and voted on by the general public. The moderation of the platform was mainly in the hands of 21 Solutions, who used the mass comment feature that is built in the platform. The platform fitted perfectly in the broader communication strategy crafted by Brussels-Capital Region. The platform served as a welcome extra interactive channel to get more people involved. The final selection has been made and the projects that were chosen are now discussed by the Regional Government.